This Cabo FAQ is all you need! That picture to the right? It's a typically gorgeous Cabo vista. Get used to it. Got a question to add to the Cabo FAQ? Please use the email link at the bottom of the page to ask any unanswered questions. We promise a response! Cabo is almost entirely desert? Most of the plants you see aren't native. And they get a lot of water. Usually, that water is "gray water," so don't sit on the grass! Need a memory foam mattress? Try Tempurpedic! 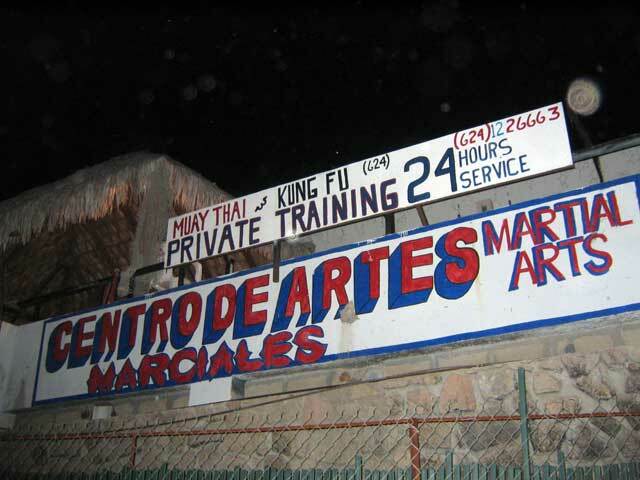 Are there any all-night kung-fu parlors in Cabo? What about El Squid Roe? It's pretty much what you'd expect from a tourist trap. Loud and overpriced. Why is there a green chicken all over this web site? There's a park on the west side of Cabo San Lucas with a chicken topiary. It's totally cute and totally Cabo! What's the one piece of advice you'd give that isn't on the site already? Walk around to find the things that we don't know about yet... then tell us about them! Where can I find more free info about Cabo? We'll post some links here soon. Until then, try Google. I will be getting a wheelchair at the Cabo airport, how can I get help with my luggage? If you need assistance with baggage in the Cabo airport, it's usually a good idea to ask a flight attendant as they're passing out the visa documents on the flight. They'll best be able to provide up-to-date information on assistance available in the terminal. Where do cruise ships drop anchor when stopping at Cabo San Lucas? Cabo cruises usally anchor in the bay between the Hotel Beach and Lovers Beach and allow you to take a tender from the ship to the marina. Where can I find Cabo prostitutes or Cabo escorts? Are you serious?! OK. Rumor has it that the hookers in Cabo hang out behind El Squid Roe and Cabo Wabo. We think they might just be drunk tourists, but what do we know? Cabo escorts can likely be found in the phone book. Yes. Cabo is safe. There's only one road out of town. Not a great spot for a kingpin to hole up. 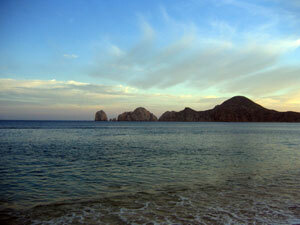 Besides, the Cabo economy is almost entirely tourism based, a drug war wouldn't float here. Most of the drug stuff is in Ciudad Juarez and other cities and border areas. Swine flu Los Cabos - Any worry of swine flu pandemic in Cabo San Lucas? Any place in Mexico with domestic and international travelers mixing is of concern in a potential swine flu pandemic. That is not to say there are any confirmed swine flu cases in Cabo. (There aren't as of 5-1-09.) But you might want to take precautions. Check the international swine flu map at swine flu tracker for up to date infomation on swine flu cases in Cabo. Let us know if you have any other questions. I have a two-year old. Is a water taxi to the Arches safe for small children? The big trick is getting in and out of the water taxi. There are no facilities at the arches, and often none when you're boarding/exiting from the mainland either. Waters can be choppy. Surfaces slick and rocky... Consider leaving the little one out of a water taxi adventure, but it's up to you. Can I walk to Lover's Beach? Sure, but you'll spend more time climbing perilous hills. Better to take a water taxi. Are there any times I should consider NOT going to Cabo? Easter and Cabo Spring Break are special times in Cabo. Where is the best snorkeling in Cabo? Try the near the arches. There's also a good spot near San Jose del Cabo. What about a Hawaii vacation property? Weird question, but if you're looking for a Hawaii vacation home, visit this excellent Hawaii oceanfront real estate link. Why is the email link at the bottom of the pages messed up? Oh, it's not anymore! Our pals at Eden Marketing showed us how to prevent spambots from harvesting our addresses while allowing them to display normally! Will you link to my site? Can I link to yours? There's a link at the bottom of every page! Where's the best map of Cabo San Lucas? You should check out our Cabo map page. The advice there is spot on. The best maps are free for the taking all over Cabo.